Vacation rental townhouse. Sleeps 9, 3 bedrooms, 2 bathrooms. Dogs allowed. 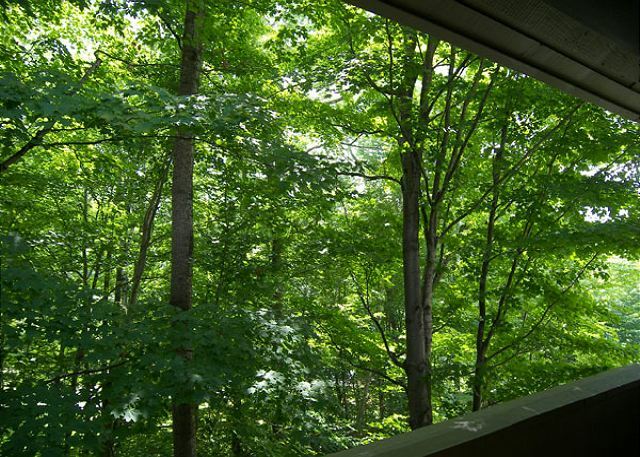 Wooded summer view from the back deck. Living room with spacious seating. 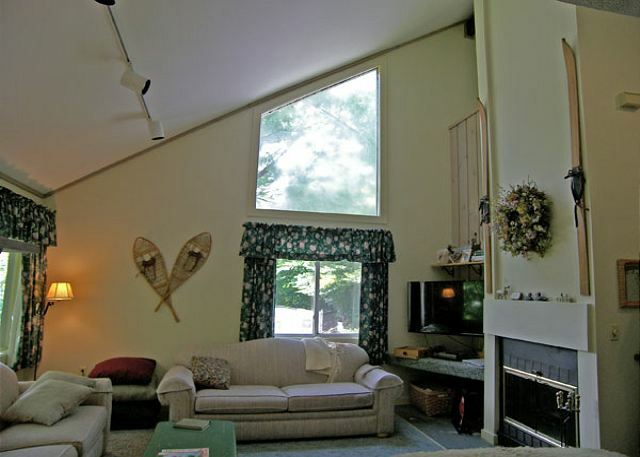 Alternate view of the living room area with wood burning fireplace and large flat screen television. Sitting loft with television, DVD and VHS. 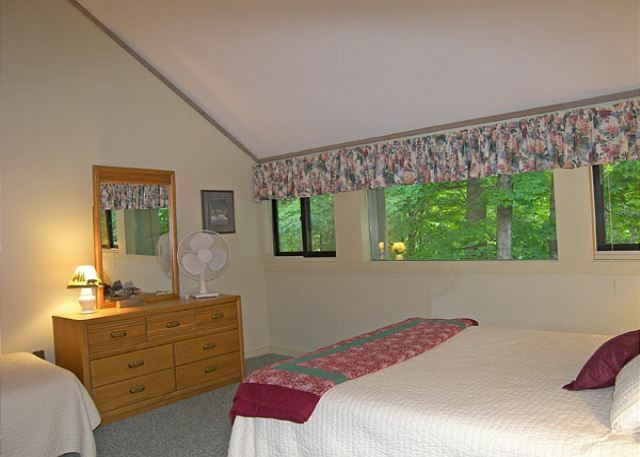 Master Bedroom with queen bed, twin bed and full attached private bath. Alternate view of the master bedroom with queen bed and twin bed. Downstairs bedroom with queen size bed. Downstairs bedroom with queen bed and a set of bunk beds. 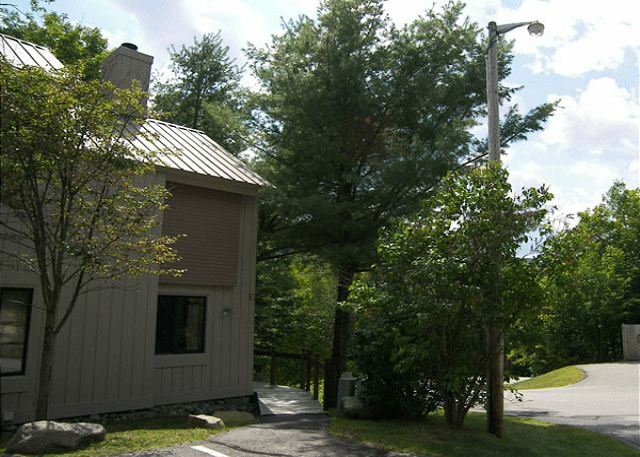 You will enjoy this multi-level vacation home located at the entrance of Clearbrook II. This townhouse offers three bedrooms, two baths, a spacious open concept living/dining/kitchen area and a loft sitting area. Located on the lowest floor of the townhouse are a full bath, laundry room and two bedrooms. 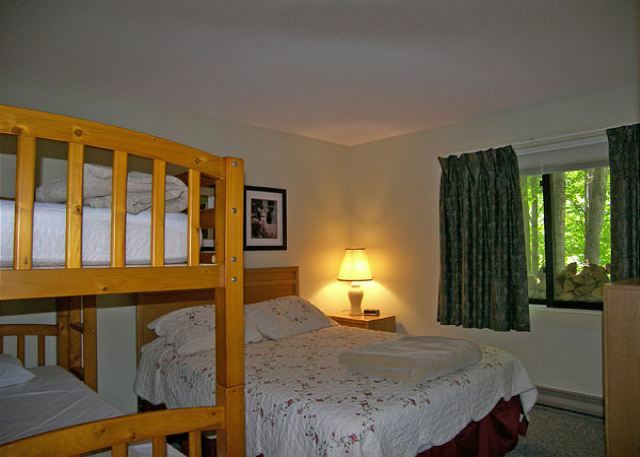 One bedroom offers a queen size bed and the other has a queen size bed and single set of bunk beds. The mid-level of the townhouse holds the open concept living room, dining area and kitchen. 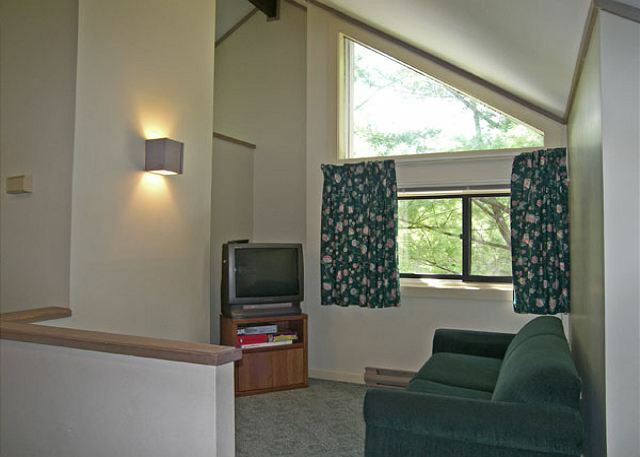 The living room has a wood burning fireplace and a large flat screen television with DVD player. 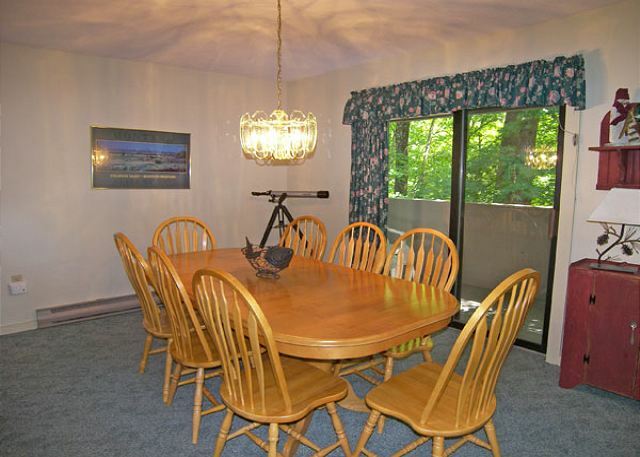 The dining area has a large dining table with seating for eight. 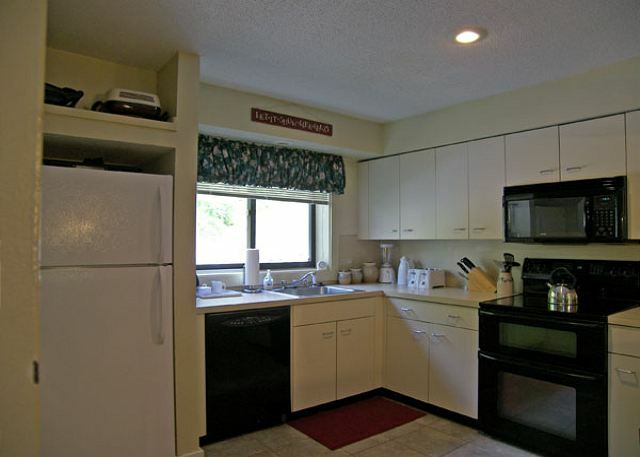 There are four bar stools at the kitchen counter located just behind the dining table which can be used for additional seating.The full kitchen with microwave and dishwasher has plenty of space for multiple cooks. 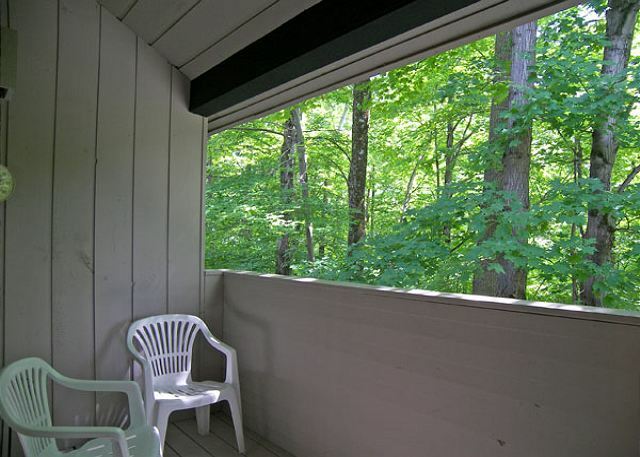 The deck is accessed from the mid-level and has a wooded view. 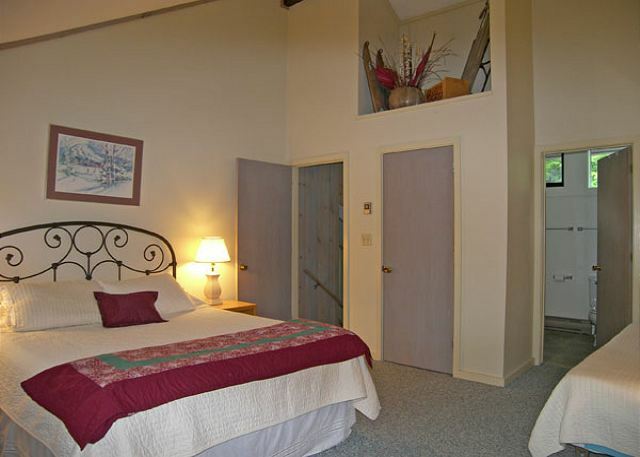 The fully enclosed master bedroom suite with a queen size bed and a twin bed is on the upper-most floor and has a private attached bath. Finally, the sitting loft with TV/DVD/VHS is on the landing between the living room and master suite. Your stay includes membership in the Village Swim, Tennis and Fitness Club with two indoor pools, two outdoor pools, three hot tubs (one outdoors), sauna, exercise room and 12 tennis courts for your enjoyment. Overall, a great unit. Close to the mountain with shuttle service. The unit is comfortable and well laid out. Parking can be an issue in Clearbrook, but that is a problem the whole community has, not just this unit. The heating system should be updated, as the electric heating is expensive. Nice large condo fireplace nice could use some spices, oil and sugar stocked. Excellent place, very clean and quiet! The unit was very clean and all ammenities were in working order. The bed in the master bedroom was very uncomfortable. The units location was on the corner of the property at intersecting roads - parking was very close to the street. Greathe time on this,area lots to do and see. Rental property was perfect for our needs. There was lots of room for everyone on our party and it was great to be able to have a place to regroup after busy days sightseeing. This unit was very clean and comfortable. Normally it is a good spot to see the bears that visit the dumpster across the street, but not this time since it was being constantly worked on. Still a nice central location in the White Mpuntains. Jeans Playhouse was spectacular and we always enjoy Gordi's. The place was comfortable, very clean, and spacious for nine people. Would definitely rent again and recommend it to others. Very nice. Clean and convenient. Returning Customer to this condo. It was a great experience and the condo is beautiful! We truly enjoyed out time there, the area is beautiful. Nice to have a place to return to every time. Glad you enjoyed it again! We were five families with 11 adult and 6 kids, this place was very good, the house is perfect for vacation break, kids had lot of games and fun to do in house. We cooked food for most meals and had fun. Also the location of this is right on Route 112 so that makes it convenient for scenic drive. This place should be fun even for winter as it has perfect setting and staff in reservation office was very friendly. Superb, the condo was lovely and had everything we needed for a perfect weekend! Great unit which is kept very clean and uncluttered. The kids loved seeing a black bear who frequented the dumpster across the street, which you can see in a grey fenced enclosure across the street. Peaceful and and easy ride everywhere. The only thing missing was a potholder to get hot things from the oven! Had a wonderful Canada Day weekend at Clearbrook. My only complaint with the facility was that there was no on-site recycling program. I called Loon Reservation Services the morning that we were checking out and they informed me that if I left the recyclable materials in the condo, they would handle it for me. I understand that there might not be enough room in the complex for a recyclable material drop off point, but I really believe that it should be implemented in the near future. Otherwise, the stay was great. No complaints about the facilities or the services. The email that I received on the day that we checked in detailing everything there was to do that weekend in close proximity was a very nice touch. 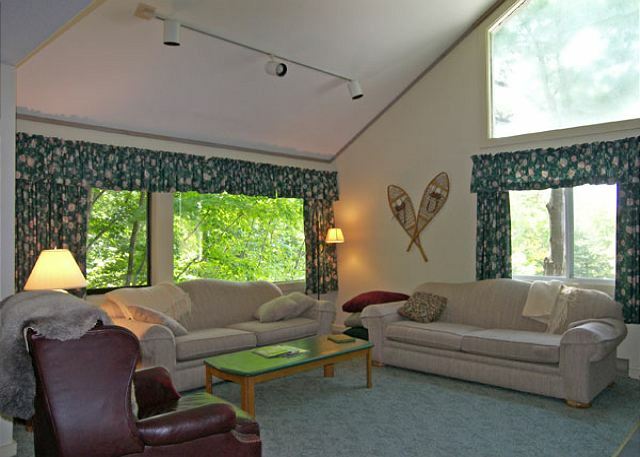 When I come back to NH, I will most definitely be booking with Loon Reservation Services again. Glad that you had a great time! Having at least basic cable turned on would have been good with 3 teenagers but other than that everything was perfect as usual. Thanks. We're glad that you enjoyed your stay, and probably got in some quality family time, but cable should have been available. Did you let us know during your stay? We'd have been happy to check into it. We'll do so now. Awesome accomodation amidst beautiful location. 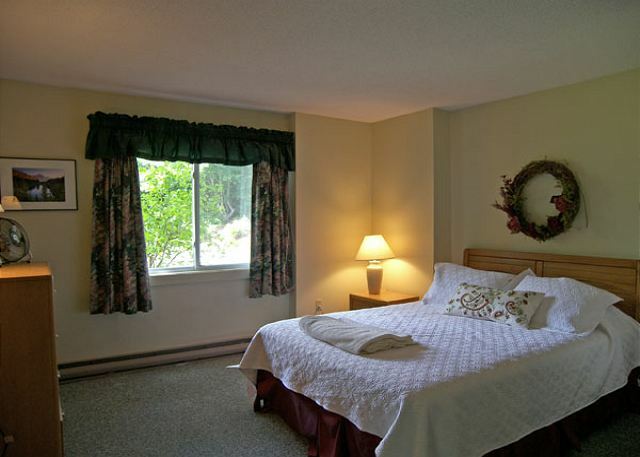 We're happy that we could find awesome accomodations for your group! My friends and I were very at home the minute we entered the condo. We were happy to see how the owners have furnished the condo with everything you would want to have in your own home, from the assortment of games, music, books(wish i had more time to pick up one of many good books to read). I found it even more homey when we saw the family pictures scattered about. My immediat family and i are looking to plan a vacation with the kids. When i came home and told my youngest son he said it sounded awesome and why can't we plan a vacation there. I told him that we would look in to it. Looking forward to another stay! It's great to read how much you enjoyed the home, and we look forward to hearing from you again!